Along with fleas, ticks are one of a pet owner’s least favorite insects. The blood-sucking bugs are especially a problem for pets who spend a lot of time outdoors rolling around in the grass and bushes where ticks live. Ticks can be a painful annoyance to both you and your pet, and they can transmit dangerous diseases. To help you keep your dogs and cats tick-free, be sure to consider the following tips! The first and probably most effective thing you should do to prevent your pets from getting them is to eliminate the ticks that live where your pet spends time. Start by keeping your lawn and bushes trimmed. The fewer places you give ticks to live and breed, the less of a problem they will become. In addition, consider treating your lawn with one of the many available commercial sprays and granular treatments. These treatments are designed to kill the ticks that already live in your lawn and make it unlivable to new ones. Just be sure to use precaution when handling and using these treatments as they are toxic to both humans and pets. 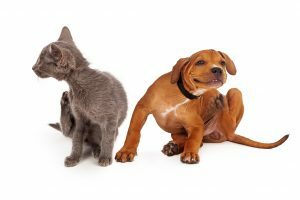 There are a wide variety of treatments available that are designed to keep dogs and cats from getting them, and many of them are quite effective. These treatments may come in the form of powders that are applied to your pet’s fur, pills that can be ingested, spot treatments applied to the skin, and even collars that your pet can wear. Tell your vet about your pet (breed, size, age, etc.) and he or she will be able to recommend a treatment that will work best. If at all possible, keep your pets indoors, especially during the spring and summer months when ticks are most prominent. When you do let your pets out, try to keep them away from tall grass, bushes and wooded areas where ticks reside. After your pet comes in from outside, be sure to check for them, searching underneath the armpits, ears, between the toes, and any other places a they might be. If you find one, carefully remove it, making sure to pull out all parts of the tick that are stuck in your pet’s skin. Dealing with ticks can be a frustrating hassle, but it is absolutely necessary for the health and happiness of your pet. If you would like to learn more about how to prevent ticks and the medications and treatments we have available, feel free to contact us today!